It is a worrying fact that the UK population is growing fatter. This, together with an increasing consumer awareness of the problem, presents manufacturers with a huge market to target. Since 1980, the number of obese adults in the UK has nearly tripled – this has been called the obesity epidemic. In the UK an estimated 61% of adults and 31% of children are overweight. According to Mintel figures from 2009, almost a quarter of adults in England were classified as obese (BMI 30kg/m² or over). The Foresight report, used to guide government policy, has predicted that by 2025, nearly half of men, and over a third of women, will be obese. The market for low-fat, low-calorie and reduced-sugar products increased very rapidly between 2006 and 2010, rising from £3.84bn in 2006 to £5.33bn in 2010. This growth is a perpetuating cycle — as the Government pushes to achieve greater consumer awareness of a healthy diet and tries to address the UK’s current obesity epidemic, more consumers are looking for a quick-fix, convenient way to diet. The explosion in popularity of these foods has resulted in companies and manufacturers rapidly expanding their ranges to keep up with consumer demand. We are seeing that there is potentially a trend away from healthy, naturally low in fat or sugar type products, and a move towards foods that very simply convey efficacious weight loss, at the expense of purity and naturalness in some cases. So what’s going on out there? And where are the opportunities? Lighter food ranges – Light can come in many guises – reduced-fat, reduced-calorie and reduced-sugar. These types of ranges and claims have become common diet currency over the years, and many brands are jumping on the bandwagon. 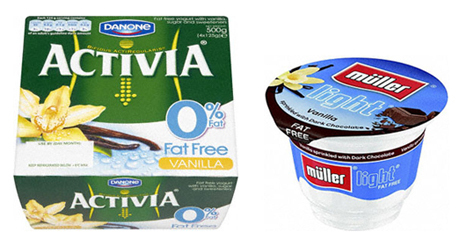 Clever brands like Müller are going one step further by combining fat-free with indulgence by launching a range of light yogurts with chocolate sprinkles. Specialist weight loss brands – Some brands are designed to assist with weight loss, like Alli and Adios. Alli uses a scientific, more pharmaceutical approach, whereas Adios pitches itself as all-natural. Could these two ideas work together to create a bio-pharma weight loss brand that offers ‘natural efficacy’? Slim-fast single-mindedly positions itself as the speedy weight loss brand – inherent in its name and devices – it uses the 321 Plan. In contrast to speedy weight loss, could there be an NPD opportunity for steady and sustainable weight loss too? Weight Watchers – Weight Watchers has repositioned their brand to appear much lighter. The brand feels more optimistic and upbeat. It’s really working appetite appeal in a fresher way – not just with visuals but also with emotive product descriptors like ‘delicious’ and a ‘hint of’. Could you inject more emotion into your brand without compromising functional reassurance? Tasty Little Numbers – A clever new slant on the old low calorie message – everything in the range is made to exact whole numbers of calories and it features the calories as its main visual on pack. The insight behind the range is about making calorie counting easier. Calorie counting seems to be making a comeback with online apps, like My Fitness Pal, designed to make the onerous task of dieting much easier. Could product positioning or NPD help solve a bug bear? Don’t forget appetite appeal – John West has successfully balanced the visual communication of lightness through colour, and its calorie roundel, while keeping its appetite appeal. There is a common misperception that diet food is less tasty, so it’s important to offer plenty of reassurance that your product is still delicious. It’s a double benefit for the consumer – good for me and tasty. Sainsbury’s Be Good to Yourself on the other hand have prioritised the reduced-fat message, and haven’t given appetite appeal a second thought. Could existing diet brands enhance appetite appeal through a packaging redesign?An alternative angle on appetite appeal, could be to create an indulgent range for dieters by offering a treat which feels ‘naughty’, but is less ‘naughty’ than usual. Could gourmet brands with lots of appetite appeal, like Gü, stretch their brand into lighter versions for example? Employ intelligent claims – There is a move towards ‘hunger management’ with benefits and claims around feeling fuller for longer. 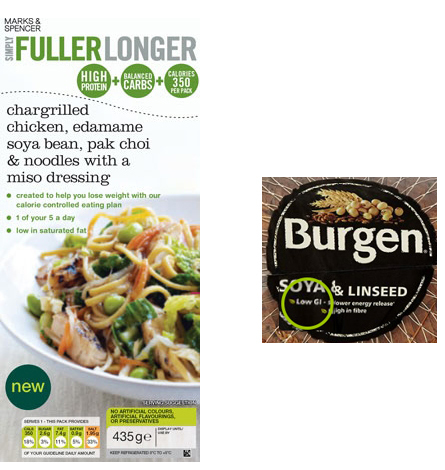 Marks & Spencer has tapped into this with their Simply Fuller Longer range. These types of products are the antithesis of traditional low and 0% diet products. They make claims focused on the good stuff, like high protein, and are actively countering the negatives around hunger with words like ‘fuller’, opposed to the absence of negatives like ‘low-fat’, ‘low calorie’ and the empty feeling that slimming can evoke. Another intelligent claim is Low Glycaemic Index (GI), which is also associated with feeling fuller for longer. Could your brand benefit from an intelligent claim on an existing product so that it has wider appeal to a weight loss consumer? Could you use some of these types of claims to add reassurance that your diet brand is still satisfying? 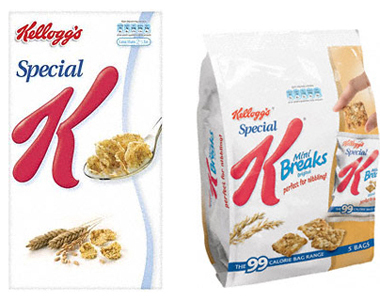 Use NPD to stretch into new usage occasions – If you are already a weight control/diet brand, how can you stretch your offer into convenient/on-the-go formats like Special K have done? Or, if you are already there, can you stretch the other way? Could a brand like go ahead! move into meals or cereals, for example? Quick wins – Packs with portion control – Can you make it easier for calorie conscious consumers to choose you, even if you are perceived to be indulgent in some way? Looking at packaging could be one way to unlock this. Could you make your packs smaller so that calorie intake can be forcibly moderated? Could you calibrate your packs with a clearly marked calorie controlled serving size, like Maltesers have done? Or, could you go one step further and use the actual product to deliver portion and calorie control? Be ahead of the game with interactive packs – Interactive packs are also on the increase, with the uptake of apps like My Fitness Pal, you can now scan the QR code on the product to upload all of the nutritional information you need to know how many calories, grams of fat and sugar you have consumed. This is also a great opportunity to drive direct brand engagement and offer additional weight loss tips and support, direct to the user’s phone to really reinforce your expertise. 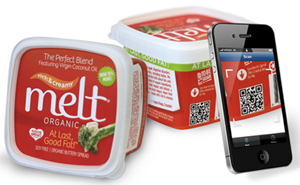 In the future, weight control consumers could potentially start screening brands based on the quick availability of this information, so don’t let the lack of virtual nutritional information delivered via QR codes be a reason for them not to choose your brand. 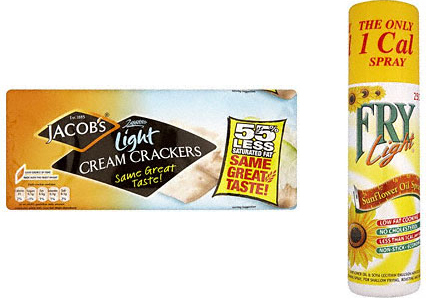 Extend your brand – Jacob’s, a biscuit brand inherently associated with indulgence, has stretched into weight control, majoring on a 55% less saturated fat claim. We also see other brands capitalising on this in many other categories, such as cheese, yogurt – and even oil, in the case of FryLight. This goes to show that it’s perfectly possible and acceptable for categories perceived to be fattening to innovate with lighter versions, as long as you have a strong diet related product claim. But who will be first to do it in confectionery? Nestlé perhaps?